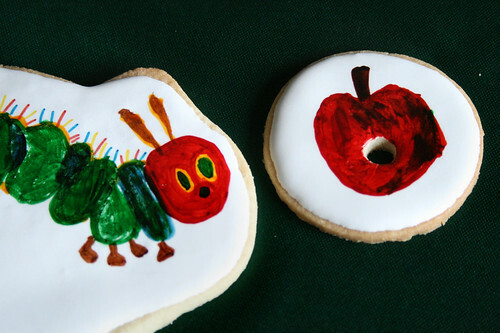 The Very Hungry Caterpillar… in cookies! Who doesn’t recognize this friendly little guy?! If you have children, or if you love children, chances are great that you are quite familiar with Eric Carle and his book series. 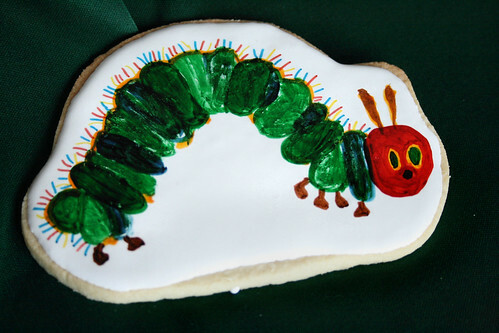 This guy is the feature character in The Very Hungry Caterpillar, and he is on his way right now to Atlanta, GA to help twin little girls celebrate their 1st birthday in style! 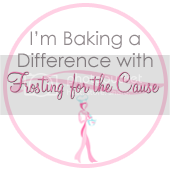 For the first time, I tried a technique taught by Renee, of Kudos Kookies. 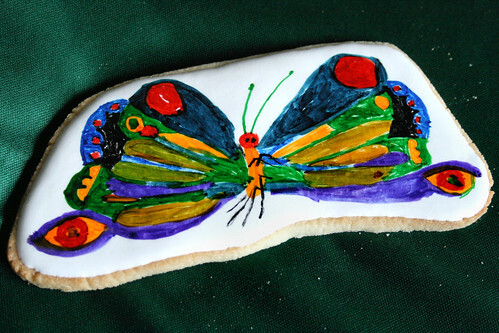 She made the art of “painting” on cookies look really possible! And do you know what? It’s SUPER-EASY! 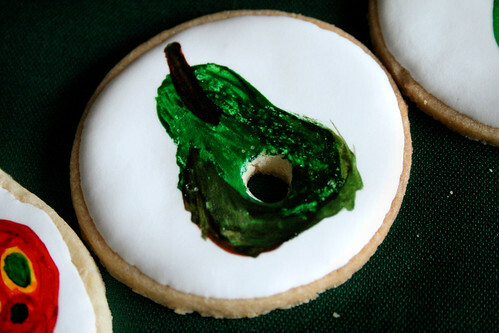 When I decided to create these cookies, I had known that “painting” would be essential. I don’t think there was any way that flat royal icing (one color at a time) could have achieved such a rich effect of colors and shading. I was able to blend greens & browns with strokes of red for more realistic-looking fruit… and I’m not even an artist! 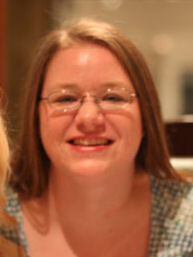 Thank you, thank you for your teaching and encouragement, Renee! I did struggle in photographing these cookies, however. No matter how I tried, I couldn’t get the light to fully capture the varied tones of the paint. 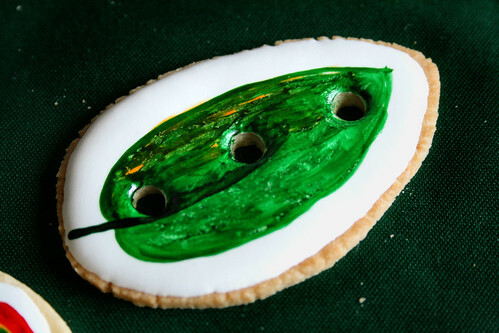 Also, the painted cookies keep a “wet” look about them (even though it takes just minutes, at most, to dry). That sheen helps them to really look like fine canvas, but it produced difficult glares in photos. 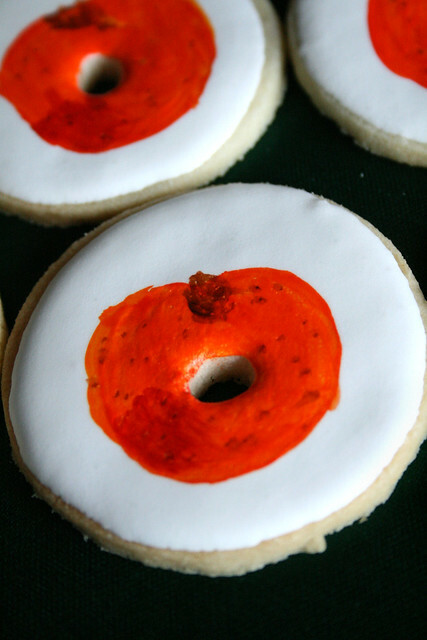 I promise, these are a cookie that I wish I could have shown all of you in person! 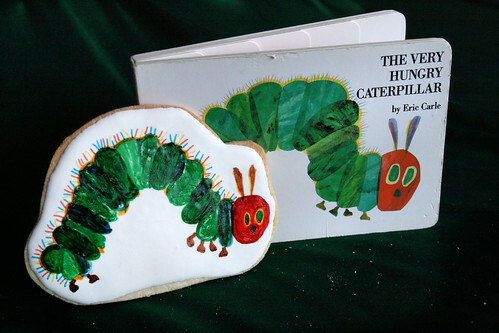 After eating through many other types of food, the hungry caterpillar ate through a BIG leaf! 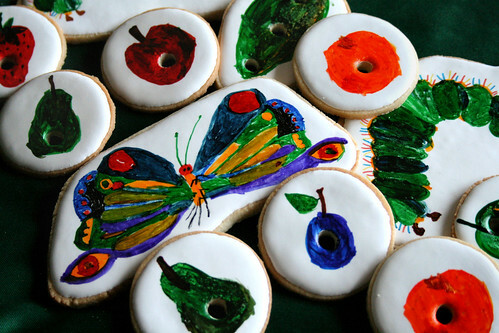 The very hungry caterpillar is now a big, beautiful butterfly! I had *such* a wonderful time trying out a new technique, and I hope the recipients love the cookies they should be receiving tomorrow (c’mon, Mr. UPS Man!). 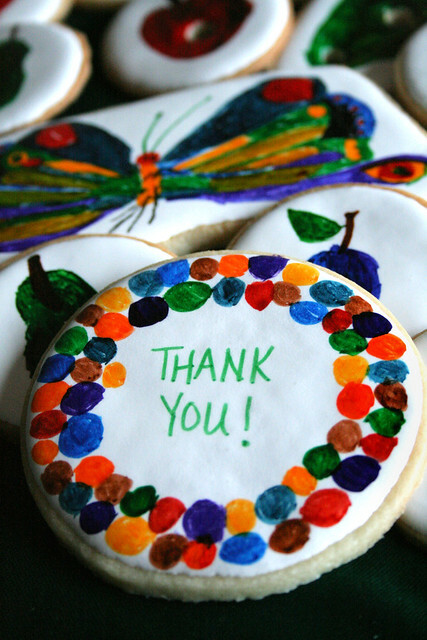 The coordinating Thank-You cookie (matching the inside cover of the book). A tip: If you decide to paint cookies for an occasion, be sure you take any/all cute pictures you want BEFORE eating the cookies. The food coloring is nearly full-strength, and whew, does it ever turn your mouth and face pretty colors! « Citrus Peeler – Works For Me Wednesday. 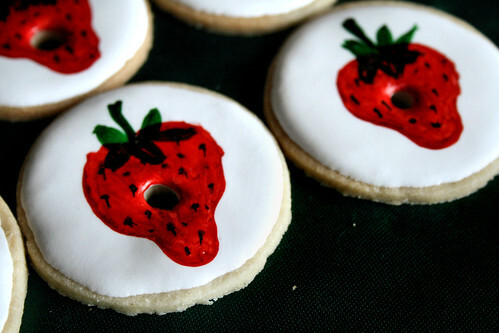 These cookies are so awesome! You did a wonderful job with painting them (it’s fun isn’t it?). 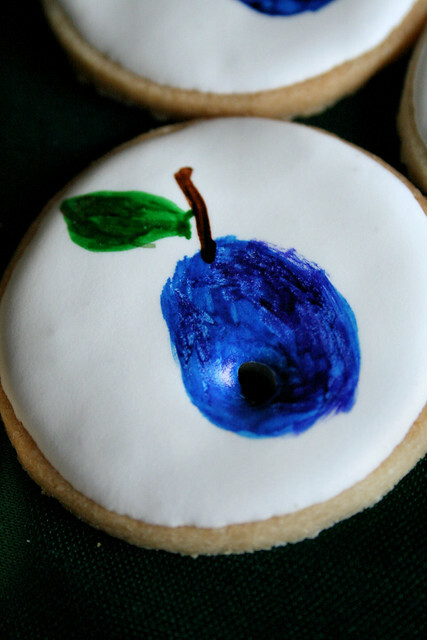 I’m glad I could help you in some small way make such adorable cookies. Thanks for the shout out too. Those fruit ones, with the holes are priceless!!! Love them!!! Thank you, Renee! Again, there is NO WAY I would have attempted this without your encouraging video. You were my cheerleader, even if you didn’t know it! Oh Nic these are just great! Lily LOVED looking at the pics of them! You have such talent! You are amazing!!!! What beautiful cookies!!! Thank you! I appreciate your hopping over to check ‘em out! Thanks, Sue! I just used a regular drinking straw to make the little cut-out holes – it was the perfect size! I’m so glad you enjoyed looking, and thanks for hopping over! The cookies arrived safely in Atlanta! Thank you so much! I am so excited to show them off! 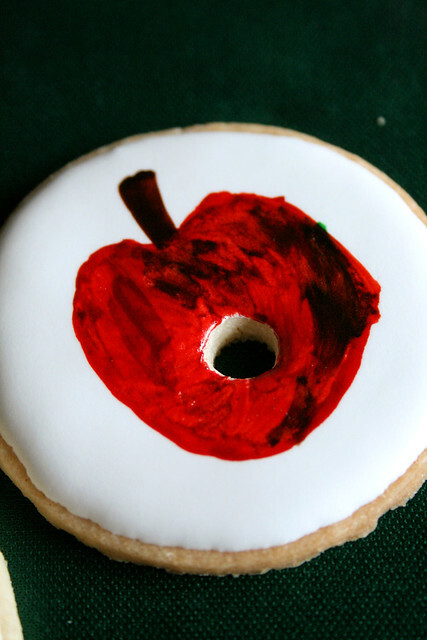 My mom and I HAD to test them out before we could have anyone eating any…so the “Thank You” cookie is long gone;). Delicious! My tongue is a rainbow of colors…ha. Thank you so much for sharing your talent! Complete coverage of the party will be on my blog…webekings.blogspot.com. I’ll definitely give you a big shout out! Oh, these look great! you have really captured the beautiful artwork, the colours and the brushstrokes, I am definitely going to try this! WOW!!! 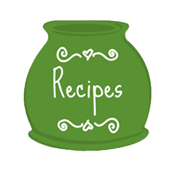 that cookie must be huge (the book is kinda big)… anyway, did you think of using beet juice to make it less food coloring-y? These are beautiful and look great! Those must be some pretty large cookies. ^^ I think I should use this technique with my next batch of photographable cookies.